Not often do you get to watch a movie that lets older veteran actors be exactly what they are - older veteran actors, bringing their immense experience to a great character role. Each year the subject of aging and what it will mean becomes more front and center to me. When you're young, the feeling of time is enormous. You'll get to that next year. There is time to try a new career, to travel the world, to marry and start a family, to set aside enough money for a great retirement. Time can evaporate quickly. Life can take unexpected directions. 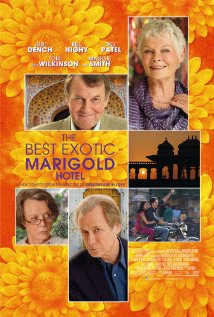 I have said many times that aging is more than just a number.The Best Exotic Marigold Hotel offers a great, comedic tongue-in-cheek look at several British seniors who, because of limited funds, decide to throw caution to the wind and give a go at embracing retirement in an exotic location - India. 20th Century Fox assembled a great set of respected actors - Judi Dench (one of my absolute all-time favorites), Tom Wilkinson, Maggie Smith, Bill Nighy, Celia Imrie and Penelope Wilton. 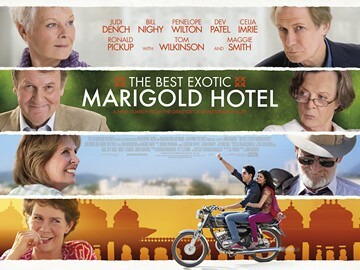 Bringing a youthful element to the movie are Dev Patel as the enthusiastic hotel proprietor with grand dreams of turn a crumbling, but beautiful old building into an luxurious destination and Tina Desai as his girlfriend. Kudos to Patel in particular for his great comedic timing and for taking what could have been an expected character and creating a living, believable person that you couldn't help but cheer for. Much of the scrip had him a little bumbling and energetically over the top - such as in scenes like a verbal morning role call to make sure no one has died and his fabulous verbal descriptions of rooms that were still under construction - and then he would suddenly transition during a emotional moment into a thoughtful, serious young man. I will be keeping my eye on him. Other themes that arise include sexuality - both young and old - the cast system, relationships and intolerance. I always wonder if actors are uncomfortable when asked to take on an unsympathetic, racist role. Penelope Wilton did just that. She portrayed the proper British wife that looked down and refused to experience all things foreign. I keep waiting for her to soften. The best accolades I can give Wilton is she made me very uncomfortable and I found myself strongly disliking her. And that was the role she was cast in. Light-hearted and full of funny moments, this movie still had a thoughtful message to deliver for young and old - all delivered with a a good dose of humour. And the visually lush imagery offered has me ready to jump on a plane to India and start exploring. Enjoy!